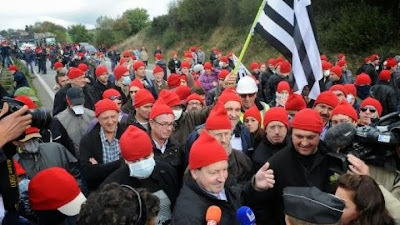 In Brittany tens of thousands of protesters donned red hats, a reminder of the Revolution against King Louis XIV. The central Government in Paris fears an escalation of the protests. In the city of Quimper it came to clashes between the demonstrators and the riot police. Some 30.000 protesters demonstrated against the austerity politics and confiscatory taxation of the Socialist Government. Angry demonstrators threw flower pots and street tiles and tried to storm city hall. The riot police answered with water cannons. Many of the protesters wore red Jacobin hats, reminiscent of the Revolution and the Terror. The Government in Paris is very uneasy. They fear the unrest will spread and escalate. They say they want to mitigate high unemployment, but at the same time the Government keeps increasing taxation, resulting in even more economic hardship. Earlier last week President Hollande suffered a severe defeat when he was forced to repeal the eco tax. His popularity is at an all time low. Truckers are deeply set against the taxation. In an unprecedented move all soccer matches for November have been called off. The soccer clubs reject the 'millionaire tax': this levy not just affects club officials, but also national and international players.